Olavi Trio's Teppo Olavi Hauta-aho, Jari Olavi Hongisto and Niilo Olavi Louhivuori share the same middle name and a mutual love for free improvisation. All three Olavi's are well-respected members of the Finnish improv and jazz scenes. 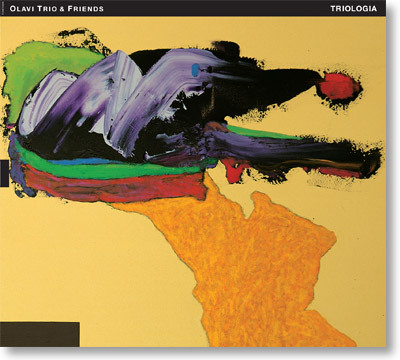 The trio's senior Teppo Hauta-aho (b.1941) has been active since the early 1960's and has been heard in Edward Vesala's, Anthony Braxton's and Cecil Taylor's many ensembles, among others. Trombonist Jari Hongisto (b.1960) paid his dues with Edward Vesala's Sound & Fury and performs with the Iro Haarla Quintet. The youngest of the three, drummer Olavi Louhivuori (b.1981), first became known through Ilmiliekki Quartet and is currently a member of Tomasz Stanko's quintet and SUN Trio. With the help of guests Verneri Pohjola (trumpet), Juhani Aaltonen (saxophone) and guitarist Kalle Kalima, Olavi Trio is constantly on the search of the holy trinity of the wisdom of improvisation, reaching for the moment and obtaining collegial harmony.